I had a plan and it was going to be glorious. It was an ambitious concept that would have inspired a community and brought something new to EVE. It was also naive, foolhardy and doomed to failure. Here’s what happened. Recently, during a chat between regulars in the Old Pond Pub, one pilot, Wamphyrri, mentioned that he was flying around in a solo PvP Rifter that he wanted to test out. The problem with experimental solo PvP fits is that a proper field test can be difficult to find. Hunting for a genuine solo opponent that you can trust not to have friends lurking nearby can be time-consuming and fruitless pursuit. However, one of the benefits of our loose community in the Old Pond Pub is that such an opponent can be found there. Take note of that last sentence as it would later come back to haunt me. After a brief chat about location, we arranged to meet in Amarr. Vsmit, another Old Pond Pub regular, also wanted in on some combat practice and headed over too. We chose Amarr as it was a trade hub with a plentiful supply of affordable ships and equipment to sacrifice in the name of combat practice. A good time was had by all and I lost a lot of Kestrels to the boringly superior Rifter which the other two pilots favoured. It was a fun evening and one that gave inspiration to a grander idea: a travelling high-sec Gladiator Circus. It would be fantastic, we could move from mission-hub to mission-hub with an Orca packed with cheaply fitted frigates and invite local missioners and new players to try their hand at some risk-free PvP. We could keep some kind of leaderboard for regulars, run competitions, invite guest stars to fight all-comers. Imagine a one-night-only opportunity to have a shot at your (least?) favourite EVE celebrity. The idea could evolve from there in a number of directions which I was excited to explore and with the (then) impending learning skill point reimbursement, I could insta-train for Orca piloting and start looking onto getting the scheme going straight alway. I fielded the idea to the good folk in the Old Pond Pub and the feedback was positive. Several pilots seemed quite attracted to the idea of being a celebrity combatant, others saw an opportunity to sell goods alongside the local spike that it would cause. I began to dream of a carnival atmosphere with friendly combat at it’s centre. It would be a festival of combat, commerce, recruitment and comedy. Come Incursion patch day part two, I began my search for the Orca that would be the pivotal centrepiece to the whole enterprise. To my dismay I found that overnight the Orca price in Jita had spiked from around 330million isk to nearly 500m isk. Perhaps the crafty marketeers had predicted increased interest due to the skill point reimbursement. Unperturbed, I spread my net wider and began scouring nearby regions for a better deal. The best available was for 380m over in CONCORD-controlled high-security space. Oh well, it’d have to do, so I rushed over there, bought it and threw 1.5m of my unassigned skillpoints into being able to jump straight in. On the journey over, I suddenly realised there was a problem. My route included a single system that was of Gallente sovereignty and they don’t like me very much. This wasn’t a problem in my Hawk assault frigate as I could breeze straight through before the Faction Navy appeared to give me a hard time, but something as big and slow as an Orca could be in trouble. Any other route would take me through low-sec, which was out of the question in an unescorted Orca. Gallente space it was then – I needed to find out more about the sort of response I could expect from the Faction Navy forces that would appear. Would they scramble me? How much damage would the responding forces inflict? My enquiries remained unanswered in the Old Pond Pub and I didn’t really want to advertise what I was about to attempt in too many other places. I popped onto Singularity, experimented with a Drake in Gallente high-sec and soon determined that the response would be in the form of four faction vessels who would webify and inflict quite impressive damage but would not scramble. I felt that the Orca could easily withstand the damage in the time it would take to align and warp and the webifying would even help. But just to be on the safe side I would fit an Inertia Stabilizers to assist with the aligning and a Damage Control to boost the effective hitpoints. Back in New Eden proper and I was prepared to run the gauntlet. I had decided to name the Orca ‘The Free Boot’, but would rename it on gladiatorial occasions as ‘Big Top’ to add to that circus feel. I stored my Hawk in the Orca’s ship maintenance hangar and proudly headed out on the maiden voyage of the Orca that would bring consensual PvP to the masses. As I slowly made my way through the six systems leading to the troublesome Gallente system of Synchelle I was feeling quite confident and pleased that I had been so thorough in my planning. I intended to dock in the system preceding the hostile one in order to scout ahead with my Hawk, ensuring there were no other surprises lurking in system. However, as I came out of warp at the gate into Tar, I noticed a Jaguar assault frigate in my overview marked as a factional warfare target. How could he be here without being attacked by the faction police? Oh hang on, I’m not in Amarr space any more am I. In the space of one stomach lurch, my excitment and confidence was instantly replaced with a sinking realisation peppered with fear and frustration. I jumped and prayed. My prayers went unanswered as the Jaguar followed me through, locked me and started chipping away at my shields. I attempted to gain some clarity of thought through the cloud of adrenaline that was now making my heart thunder in my chest. I engaged my Damage Control which would effectively double my hull hitpoints and attempted to drift back toward the gate. An Enyo assault frigate appeared and began to assist the Jaguar, which then warped off, presumably to get something capable of more damage. I sent out a cry for help in the Old Pond Pub channel. There were only two others in there, neither of whom responded. It was then that I noticed that one of the pilots was a factional warfare enemy. How could I have been so stupid? I’d been chatting to all who would listen about my grand plan and my acquisition of an Orca, including a pilot who was undoubtedly feeding information about a juicy target to his FW colleagues. As the old war-time poster said, loose lips sink ships. To compound my stupidity, it was at this point that I decided that the best survival tactic would be a ‘logoffski’. I vainly hoped the enemy wouldn’t be able to muster enough firepower to chew through early 180,000 hull hitpoints in fifteen minutes. I walked away from my desk fuming, but after thinking it through for a minute or two, came up with a possible solution. If I could make it to the gate and jump back through, I could then log-off whilst gate-cloaked and would not incur the 15 minute log-off penalty. Alas, a return to the character selection screen five minutes later showed me to already be in my pod. By not being logged on, I’d negated the use of my Damage Control and halved my EHP. Annoyed with myself, I logged back in to take a look at the lossmail. As I was doing so, I realised too late that the Enyo was still there. I attempted to warp away in my pod but was destroyed, losing my +4 and missioning implants. I felt like facepalming myself until I bled. Instead I pretended to not be too bothered whilst explaining events to the now responsive Greenbeard, then politely logged and inwardly vowed never to play that stupid game again. It’s now five days later, I’ve had a lot of time to reflect and have had some inspiration for a number of future blogposts. Sadly, as a result of my sulk I missed a Blog Banter, which was a shame as I was looking forward to participating in that. But I reckon that only now can I just about get back in the pod without being too bitter. In fact, if my suspicions about how my Orca was entrapped are true, then all credit to those who had the patience and cunning to pull it off. On this occasion I was the victim, and although it is only a game, it is this wicked web and the resultant extreme emotional responses that sets EVE apart from other online experiences. 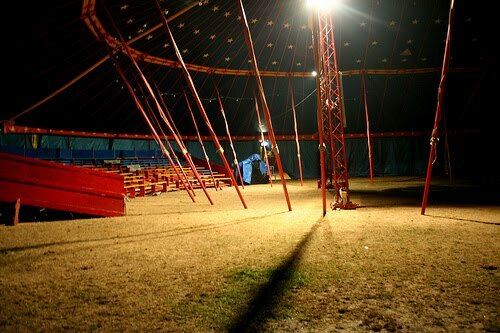 However, having had the wind thoroughly knocked out of my sails, I’m not sure if continuing to pursue to the ‘Big Top’ concept is a worthwhile cause. Any thoughts? Whatever happens, I’ll have to work on speeding up my HTFU cycle. Is there an implant for that? If it is any consolation. . . I think that your idea for the travelling circus was an excellent one. I don't know too much about the orca but would a top rack of med or heavy neuts have fended off the attackers. (Admittedly, hindsight is a wonderful thing). OUCH! Tough loss mate. Love the travelling pvp circus idea though. Your traveling pvp circus is a grand idea, Seismic! How to keep ganking dirtbags from crashing the party is the question. Well I've now withdrawn Greenbeard's Freebooters from factional warfare (it's not like we ever actually contributed anyway), so that should make it a little harder for opportunists to wreck things. Since folk seem to think the Galdiator Circus idea has merit, I'll lick my wounds, grind out some more money then look into trying again. Happily, it now seems like I have no choice but to forge ahead with the 'travelling circus' concept as a generous (and rich) individual has donated another Orca to the cause. Hey, I did start off in a combat Reaper, which didn't last as long as I thought it would.